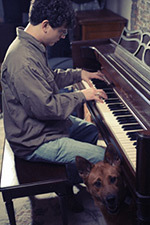 Brian Axford grew up in the capital region, and began his piano studies at the age of five. After eight years of classical piano study with Jolanta Szewcsyk and Adelina Krivosheina, he began to explore the world of jazz and blues, and studied with Lee Shaw. 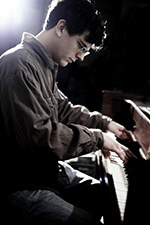 After graduating high school, Brian moved to Montreal where he completed a B.Mus. degree at McGill University. While in Montreal he studied with Wray Downes and Jeff Johnston, and gigged extensively, playing jazz, blues, rock, soul, and even bluegrass mandolin. After leaving Montreal, Brian completed a M.Mus. degree at Rutgers University, where he studied with Stanley Cowell, and spent three years living in Brooklyn where he taught music and played on numerous gigs and recording sessions. Brian Axford has returned to the Capital Region with his wife and daughter, and is continuing his musical career. He teaches private music lessons, serves as organist and music director at the Slingerlands United Methodist Church, and performs jazz, blues, stride, and gospel piano.